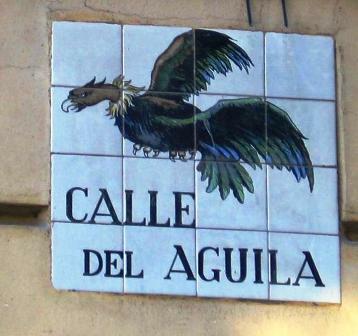 A ceramic plaque marks Eagle Street (Calle del Águila) in Madrid, but the bird it depicts is not an eagle – or even a Spanish bird. The little street in the historic La Latina district of Madrid got its name around the year 1600 because a giant eagle emblem for use in religious processions was stored there. An eagle represents St. John the Evangelist – in honor of the soaring heights of his Gospel’s prose – specifically a black eagle with a red beak and feet, or at least red claws. St. John’s eagle was also used in the coat of arms of Queen Isabel I and on the Spanish flag during the Franco regime, so it would be easy to find a historic example of that eagle, even a politically correct one. Obviously, the artist who created the ceramic plaque did not use the symbolic bird. Perhaps it represents a real eagle. Spain is home to four species of eagles, most notably the majestic golden eagle. It cruises over the Iberian countryside preying on rabbits and partridges, clad head to tail in sleek golden-brown feathers. It is not the bird on the plaque. The white ruff and bald head of the bird on the plaque are a clue that this is in fact a vulture. Spain is home to a black vulture, but it is solid dark brown or black with a bluish-gray bald head and neck – not this bird. The only vulture with a white ruff and reddish combed head is the Andean condor. That’s what the artist chose to represent St. John’s eagle: a South American carrion-eating bird with a 10-foot/3-meter wingspan that deliberately poops on its own feet for some reason, which is why they look whitish. Madrid does have a Condor Street, located in the Vista Alegre area, near streets named Goose (Oca), Toucan (Tucan), Albatross (Albatros), Finch (Pinzón), Falcon (Halcón), Turtledove (Tórtola), Seagull (Gaviota), Lark (Alondra), Thrush (Zorzal), and Nightingale (Ruiseñor). I hope the street signs aren’t illustrated. That might be insanely confusing.